Where are the Amtrak stations in Arizona? One might guess that because Phoenix, Arizona is one of the ten largest cities in the country that there would be a train station in the city. You’d have to guess again. There are only eight Amtrak train stations in the State of Arizona. The train stations have three character codes just like airports. How to Get to Phoenix From the Amtrak Station? The quick answer is, by bus. When traveling to Arizona by train, the most convenient station to Phoenix would probably be Flagstaff. From there you can hop on a bus and get to the most popular destinations in the state. Going to the Grand Canyon? Take the train to Flagstaff. Transfer to a bus that takes you to Williams, AZ and then take the scenic Grand Canyon Railway to the Bright Angel Lodge, right at the edge of the Grand Canyon. Keep in mind that if the point of your visit is tourism at Grand Canyon, Amtrak offers some special packages that might fit your schedule and budget. If you are trying to get to Phoenix, your best bet is to connect through Flagstaff. From Flagstaff you can arrange for connecting shuttle or Greyhound Bus service to Phoenix Sky Harbor International Airport (near downtown Phoenix) or MetroCenter Station in Phoenix, (northwest Phoenix, near Metrocenter Mall). I am told that Amtrak can schedule a connection from Maricopa, but I was unable to find any information on that online, so contacting Amtrak is in order if you don’t want to come in through Flagstaff. You may ask, why wouldn’t you want to come in through Flagstaff? Two reasons. It is much farther away from Phoenix than Maricopa. Warning: Don’t confuse Maricopa with Maricopa County! Maricopa is a city about 30 miles from downtown Phoenix. Maricopa County is a large area which includes the City of Phoenix and more than 20 other cities and town. The City of Maricopa County is NOT in Maricopa County! Flagstaff is at a much higher elevation than Maricopa, and they get snow. Yes, there are ski resorts near Flagstaff! That could mean delays. Snow has known to occur in Flagstaff even in April and May! Arriving on Amtrak in Tucson? There are several shuttle companies offering Tucson to Phoenix trips, although they are not associated with Amtrak; you would have to make those reservations separately. In both Flagstaff and Tucson, you can find car rental companies and you could drive to Phoenix. It takes less than two hours to get from the Amtrak station in Tucson to downtown Phoenix by car. When do Amtrak Trains Stop in Arizona? 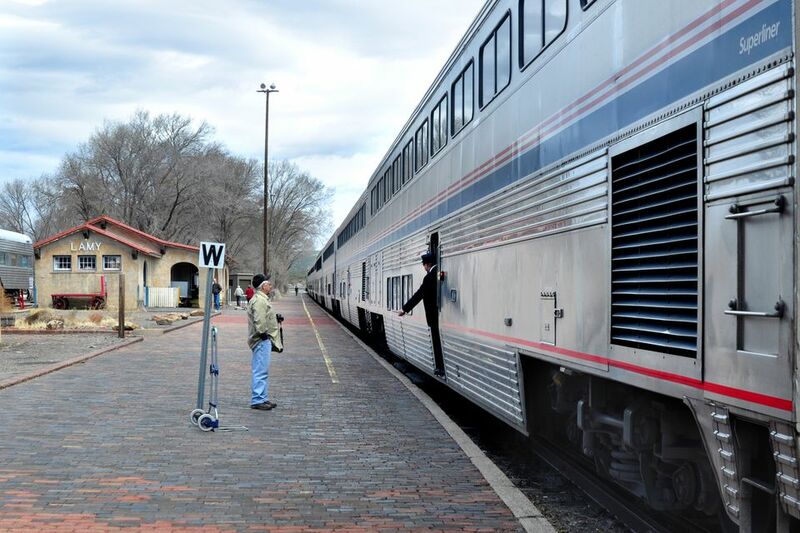 Chances are you will be traveling on either the Southwest Chief (Winslow, Flagstaff, Williams Kingman), the Sunset Limited (Benson, Tucson, Maricopa, Yuma) or the Texas Eagle (Benson, Tucson, Maricopa, Yuma). You can check the timetables online. What Services are at the Bus Stations? It varies, but check in advance. Most of them have no food, no restrooms, and no ticket counter. You’ll need to take care of those things before you leave the train station. There may not even be shade in the summer! Some people would rather travel by train than by airplane. In Europe, for example, train travel is more common than in the U.S. Service there is extensive and distances are often not prohibitive. It might be more relaxing and scenic to take the train. In the U.S. there are benefits and detriments to train travel. Here are some things to consider before you buy your train ticket. You can bring more luggage without an extra charge than you can on airlines. Seating is generally more spacious, and you can get up and walk around whenever you'd like to. Different classes of travel, including sleeping accommodations. More food choices than on airlines (if they offer food at all); nutritional information is posted online. Meals may be included with premium tickets. You can carry small amounts of food / beverages onto the train. You'll get to see the scenery along the way. Children, seniors, military and AAA member may get discounted fares (restrictions apply). Amtrak may offer special deals from time to time. It might take days to get to your destination. It may not be cheaper than a plane ticket. There are not as many trains as there are planes. There might only be a few trains per week scheduled, depending on your starting and ending points. Connections with thru transportation (buses or shuttles) may be complicated, difficult to schedule, or may even need to be scheduled on the next day after the train arrives. Also, remember that you'll have all those kids and all those bags to handle at those connections. Warning: be aware of time zones when traveling by train. Most of Arizona does NOT observe Daylight Saving Time. Trains are not necessarily known for being on time. For example, like planes, they can be impacted by weather or mechanical issues. Unlike planes, there might not be another train available for quite a while. You can't transport a pet. Wide people might not be able to maneuver hallways on the trains. No Wi-Fi on the trains that cover the western U.S.
Holiday travel may have to be booked very early.